One of the most frustrating parts of gardening is seeing a profusion of weeds spoiling the effects of all that hard work you put in. The problem is, weeding by hand is incredibly tiresome and not especially effective either. In today’s best weed killer torch reviews, we’ve got an innovative solution to this age-old problem for you. Once you’ve familiarized yourself with these propane torches and decided which of the assorted sizes would make the best fit for you, we’ll serve up a brief buying guide for you. Find out why you should invest in the best weed killer torch and what other uses these multi-purposes burners have whether you’re in the garden or out camping. Red Dragon dominates the weed killer torch space. They have manufactured their incredibly effective propane torches in the US for more than half a century and established a vise-like grip on this market. We could quite easily have reviewed 5 Red Dragon torches here across their impressive range but we try not to favor any given brand and to provide something for everyone. To this end, we opted for the overall best weed killer torch in their impressive range, the hard-hitting Red Dragon VT 2 ½-30 SVC. We checked out the handheld torch but you can also opt for a backpack propane torch which is the precise same vapor torch with the added convenience (and cost) of a backpack unit. Since our focus here is on the home user, we opted for the regulation model. If you have commercial work in mind, the backpack model makes a smart choice. Given the fact this torch is expressly designed to accommodate larger tanks of propane, it’s well worth considering picking up a dolly so you can wheel your tank around without straining yourself. While it might seem like an annoying additional expense, if you don’t want to dig deeper, we’d recommend getting a smaller model instead of making things tough on yourself. The torch itself is extremely lightweight at just over 3 pounds so, if you get yourself properly kitted up, using this vapor kit is a cakewalk. The 2 ½-inch tip means this torch is not ideal for more delicate weeding jobs. Red Dragon offer a much smaller mini-torch if you need to dance around flowerbeds. The advantage of a torch bell with a larger diameter is that you’ll be able to see off larger expanses of weeds double quick. The 30-inch handle gives you more than enough room for comfortable maneuver. Rated at 400,000 BTU, you’ll enjoy a wonderfully intense flame but you’ll have the freedom to dial things back thanks to a squeeze valve included. This allows you to moderate the flame saving you cash over time as you won’t be burning through propane needlessly. The pressure range with this model is 5 PSI to 90 PSI with normal operating pressure 25 PSI. At this level, expect to burn through around 9 pounds of propane an hour. This should translates to a couple hours of continuous use from a single tank. 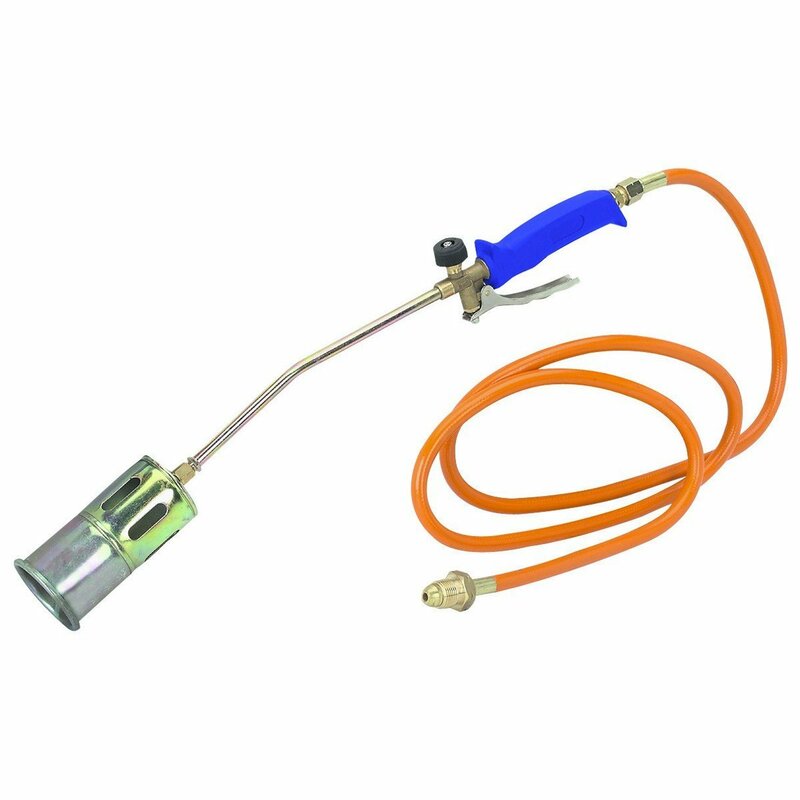 If you want to melt ice or snow, sanitize any metal animal enclosures in the garden, thaw frozen pipes or strip off paint and grease, this highly capable propane vapor torch is an adaptable ally. It’s useful for so much more than killing weeds (although it does a mighty fine job of that, too). Safety comes uppermost with Red Dragon and this model, like all of their propane torches, is fully CSA certified. Pay careful attention to the job at hand and there’s no need to panic about using this torch safely whatever your intended purpose. On the downside, even with that nifty inbuilt squeeze valve, the Red Dragon is relatively heavy on propane consumption. You can mitigate this by carefully adjusting the size of the flame but be prepared to motor through tanks reasonably briskly and take this into consideration when budgeting. Aside from the elevated price tag – and don’t worry, the money spent is well worth it – there’s really very little else we can say to knock this propane torch. If you’re looking for a reliable, no-nonsense weed killer torch made in the USA from a brand you can trust, we can’t recommend the Red Dragon highly enough. You’ll get all the power you need along with the convenience of a squeeze valve so you can regulate the flame while saving some of that precious, pricey propane into the bargain. For a heavy-duty propane torch eminently suitable for a range of applications at home or in a commercial setting, check out the 400,000 BTU Red Dragon kit today and take all the sting out of your weeding duty while having a little fun at the same time. 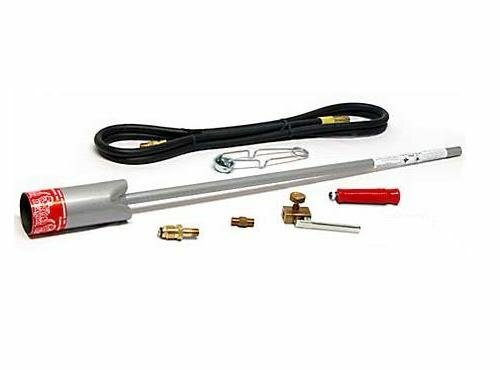 Next up in our look at the best weed killer torches is a reliable and extremely affordable model from the highly reputable Greenwood. Few lists of the best weed torches fail to include this agile little model and with just cause. This torch is available in black and orange with different model names but it’s the same equipment in all respects bar color so don’t get confused by this. Piezo electric ignition ensures you get off to a safe and simple start without being tempted to chance your arm with a box of matches. At the push of a button, you’ll be away in an instant. For such a compact unit, the heat doled out by the Greenwood is genuinely impressive. You can hit temperatures of up to 3000 degrees Fahrenheit. Whether you intend to get rid of some weeds without much manual effort or to scorch away the ice and snow that clogs up your driveway when winter comes around, you’ll have more than enough power on tap for most reasonable purposes. The nozzle and valve are both stainless steel so you won’t end up with brittle components letting you down. That said, the hose is less than ideal. This is a common issue with these propane torches so we’d suggest considering getting a replacement hose right from the get-go. The last thing you want is propane leaking out or the hose snapping when you’re mid-flow. Don’t get us wrong, it’s not a complete disaster of an assembly but it’s worth noting so you’re fully apprised before buying. Unlike many of the bigger units we’ve reviewed here, the Greenwood is a dinky little propane torch coming in at just 12 inches long. If you fancied scorching some asphalt or trying your hand at some welding, this is clearly not the torch for you. If, though, you have some moderate weeding in mind or you just want to blast away the snow and ice, the size comes in handy since it’s such a lightweight pleasure to use. As with all the best weed killer torches, you’ll be able to make micro-adjustments to the flow and retain full control over the intensity of the flame. If you need an additional burst for any reason, the turbo boost is a nifty extra. Not every gardener is looking for a hulking 500,000 BTU propane torch and we always try here to cater for everyone in terms of both price and performance. If your main remit is burning off a few weeds and you’re looking for an inexpensive weed killer torch that will also serve a turn melting snow or performing small jobs in and around the house, the Greenwood rates a mention and is well worth your further investigation. With more than adequate heat to see off even lingering, ingrained weeds and taking up very little storage space, this weed torch is a pleasure to use and makes a worthwhile investment for any gardener sick of tugging up thistles and weeds by hand. Check out the Greenwood today for a small but incredibly effective propane torch at a price you’ll love. As we reach the midpoint of our best weed torch killer reviews, we’ve got a scaled-down torch for you from the industry titan Bernzomatic. There are 2 options at your disposal with this torch. One is available with a high intensity trigger torch while the other offers the torch alone. We are not here to encourage you in one direction or the other. We will point out that the trigger is bundled at a significant discount so if you’re at all interested in expanding the functionality of your torch, go down this route for the all-in package. Don’t be confused either by the fact this flashed up as being discontinued. The repackaged model coming to market is the precise same torch in a different box so we recommend sticking with this tried-and-true model. The core function of this torch is devastating weeds expediently but you’ll also be able to make use of it to free up any ice or snow blocking your driveway in the winter or to get your BBQ when the weather turns. Since it also uses MAPP gas, if you opt for the version packing the high intensity torch, you’ll even be able to harness the swirling flame for welding or soldering work. For a torch with such a small footprint and low price tag, you’ll get exceptional value for many and a broad spread of applications. Start-up is simplified thanks to the neat Piezo igniter so you won’t need to faff around hunting down your flint lighter every time you want to nail those weeds. The valve used to control the flame also ensures the flame extinguishes automatically, a valuable safety feature. While this torch is only rated at 20,000 BTU, you’ll still be able to take care of reasonably large patches of weeds if required. The controllable flame is more than fit for purpose when you’re killing off weeds and the fact you can adjust it with ease helps considerably with propane consumption. The last thing you want is a torch that fires on all cylinders continuously even when you would prefer a less fierce flame. Build quality is admirable. The tip is fashioned from brass so it won’t end up falling apart after a few outings. If you roll with the high intensity torch, this is made from cast aluminum and built to stay the course. Everything is covered by a class-leading 3-year warranty so you’re in absolutely safe hands with this propane torch. If you favor charcoal barbecues, lighting them can be awkward, especially if you’re using lump charcoal. By using the lengthy Bernzomatic, you can apply all the heat you need from a safe distance and ensure you’re chowing down on your burgers rather than burning through a pack of matches and possibly scorching your fingers. One of the inbuilt snags with many of these torches is that they are so short you end up with a cricked back from perpetually crouching down. Measuring up at 36 inches, you’ll get no such nonsense with the Bernzomatic. For anyone picky about the provenance of their gardening equipment, you can rest assured that the Bernzomatic is manufactured on home turf in the US. There are no meaningful drawbacks to this torch with the exception of a smell that sometimes emanates upon ignition and the fact a handful of users have complained about a temperamental self-igniting trigger. Considering this is very much a budget torch, we don’t think either of these potential flashpoints are deal-breakers. Not everyone wants a colossus of a weed killer torch and this 20,000 BTU model from Bernzomatic offers a more restrained alternative if you have some lighter duty weed killing and garden work in mind. Despite its surprisingly low price point, you’ll get great brand heritage and solid build quality alongside eminently worthwhile performance. A fantastic 3-year guarantee ices the cake. And, if you want to get rid of any ice, this weed torch can take care of melting that as well! Check out the Bernzomatic today for a multi-tasking workhorse that takes propane or MAPP gas and punches significantly above its weight. As we edge toward the end of our weed killer torch reviews, next up is a 500,000 BTU beast flagged by its manufacturer as the leading propane torch on the market. The first thing to point out is that if all you want to do is burn away a few stray weeds, this torch is probably overkill. Many users refer to start-up as sounding like a jet engine and it’s certainly not a quiet operator. That said, if you want a torch that can step up to a diverse variety of burning applications, the Hot Max is hard to beat. As with most comparable torches, it measures up at 36 inches so you can keep your hands well away from danger. The 10-foot hose offers fantastic freedom of movement. Weighing in at a mere 7 pounds, as long as you lay in a dolly to wheel your tank around on, you’ll be able to shoot large flames without fatigue setting in. Be aware, too, that the flame extends a full 3 to 5 feet so make certain that nobody is in the way when you’re steaming down the garden brandishing the Hot Max. Take the length of flame into account when you’re attacking those weeds so you don’t end up with your garden fence ablaze. It’s not just raw power you’ll get with the Hot Max, though. You can adjust the level of flame so it’s not quite so lethal. There’s also a fuel saver valve in place so you can minimize the amount of gas you churn through without sacrificing performance. The Hot Max is a pleasure to use with a molded handle that feels perfectly balanced and won’t slip out your hand exposing you to a fire risk. Start-up is amazingly simple with a flint lighter to safely ignite your torch fuss-free. The odd user has whined about this tending to stick at times but we didn’t find any such problem ourselves. As with any negative feedback, it’s always worth bearing in mind but can often be taken with a pinch of salt. We would say that the rotating valve is rather less substantial than you’d hope for so make sure you’re not too heavy-handed when you’re using this. The only other noteworthy bugbear is that the Hot Max is certainly not whisper-quiet but, with this level of performance, that’s hardly surprising. If you’re in the market for a high-performing propane torch that does far more than blaze up the odd niggling weed, the Hot Max 500,000 BTU torch is a wise bet. For anyone looking to take on a range of duties, from stripping paint to thawing out pipes, liquefying snow to melting tar or asphalt – as well, of course, as playing havoc with weeds – the Hot Max is a strong contender for the best propane torch today. Last but by absolutely no means least in our study of the best propane weed killer torches is another powerhouse 500,000 BTU model from the legendary Mag Torch. If you have some very light weeding duties and nothing else on the agenda, this is not the propane torch best suited for you. If, on the other hand, you want one simple piece of kit appropriate for a very wide array of burning jobs, overlook the Mag Torch at your peril. Weed killing, of course, is a cinch with this propane vapor torch. Whether you have a few rogue shoots or a massive patch that needs some serious attention, the adjustable flame on the Mag Torch means you can attack any type of weeds in any number with consummate ease. In the winter, melt back any snow or ice that menaces your pathways and driveways without breaking your stride. Stepping beyond basic gardening duty, this propane torch is equally at home on a road gang or roofing outfit. 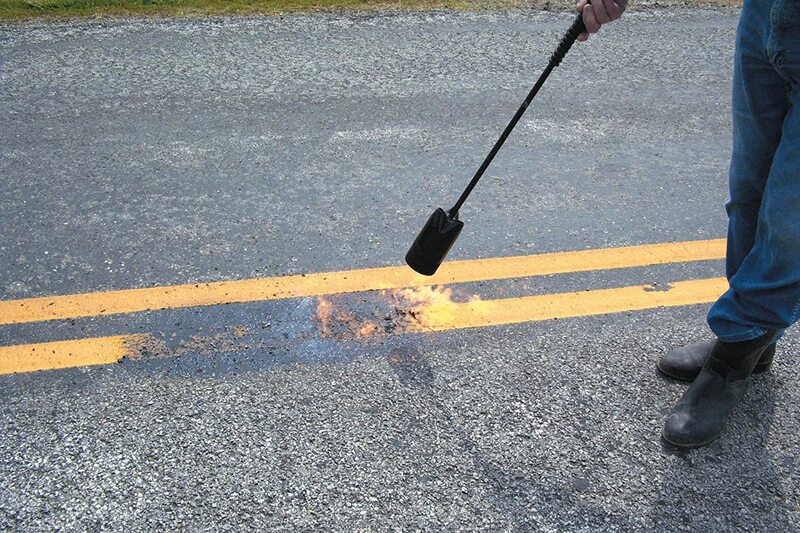 You’ll be able to work confidently burning asphalt, press it into action on the roof or use it on the farm for an assortment of burning applications. This really is a highly versatile piece of kit rated at 500,000 BTU so you’ll get all the intensity you need with the ability to ratchet the flame upwards or downwards depending on the job at hand. The Mag Torch is designed to be used with propane tanks of 20 pound capacity and upwards. As with all these weed killer torches, make sure you think about the expense of buying the initial tank as well as ongoing replacements. Too many people are attracted by what seems like a bargain then shocked at the costs involved so go in fully aware to avoid a nasty surprise. Starting up your torch is elementary with the spark lighter saving you the need to go fumbling for a separate ignition device. Once you’re up and away, the 61-inch hose afford you ample room to move around unencumbered. Measuring 38 inches, you’ll get a couple inches more length than the standard 36-inch torches on offer so maneuverability is a dream and you’ll have no need to keep bending unnecessarily. The stock hose provided is frankly weak. While the last you expect is to immediately need to perform an upgrade, we’d strongly recommend picking up a replacement for superior results. If you know how to handle a propane torch you’ll have no problems at all and you’ll find the Mag Torch intuitive and pretty user-friendly. For absolute beginners, though, the lack of instructions is a bind. The unit is also slightly intimidating if you haven’t used a weed killer torch before. If you’re just starting out, you might be better of checking out one of the other torches we review instead. If you want a poky and wide-ranging propane torch you can use for more than just burning the heads off a few weeds, the Mag Torch is well worth popping on your shortlist. 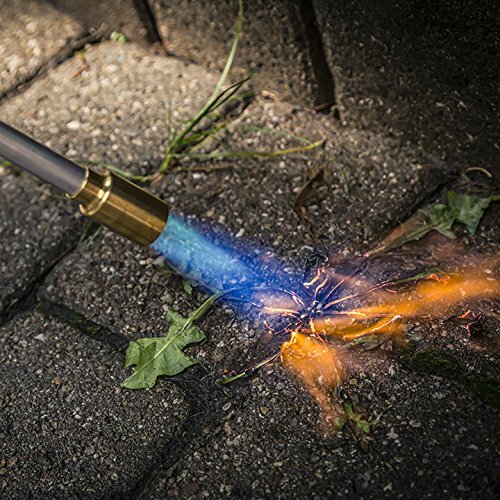 Whether you’re a roofer, a construction worker needing to burn some asphalt or a keen home gardener looking to dispatch all the weeds from a substantial space, when it comes to burning there isn’t much the Mag Torch struggles with. Buying online can often be a mixed bag but a serious incentive with this propane torch is that the price offered here is dramatically lower than you’ll find in most home and garden centers or big box stores. Get yourself a large tank of propane sorted out, order up the Mag Torch and take care of all your burning requirements in one neat little bundle. Now you’ve seen 5 of the best weed killer torches broken down, you should have a solid overview of which one would make the best fit for your gardening needs. 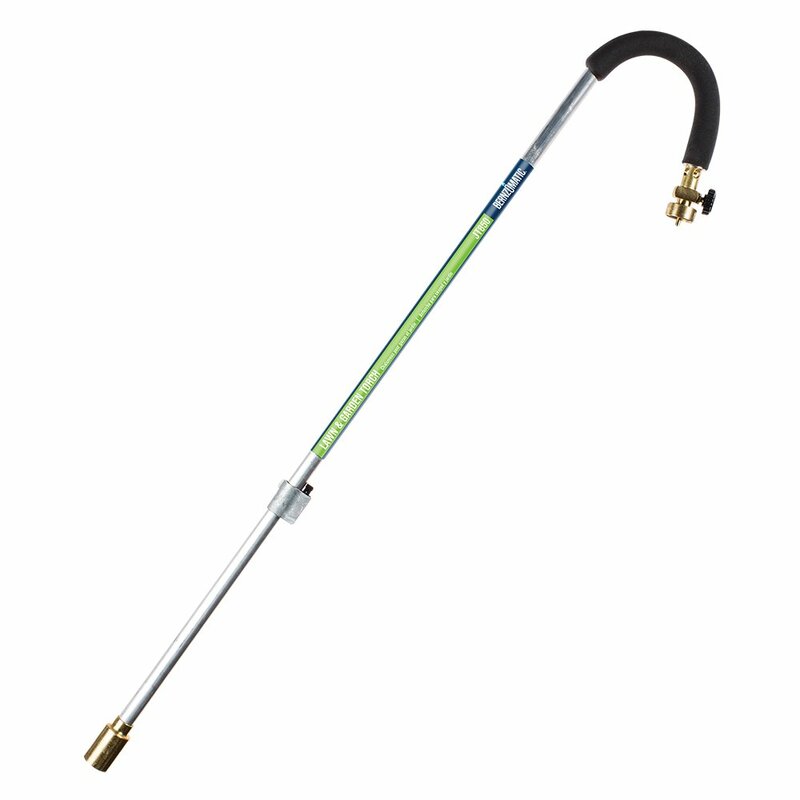 Is a Propane Weed Killer Torch Just For Eliminating Weeds? Intended usage will inform the type of propane torch you should purchase. Off the bat, these nifty devices kill weeds. That’s absolutely obvious from the name and their core purpose. We could go on here but that list should demonstrate clearly that a propane torch can be pressed into action for far more than just scorching away lingering, stubborn weeds. How do you go about getting started, though? Once you’re all fired up, how about using the torch to put paid to those pesky weeds? 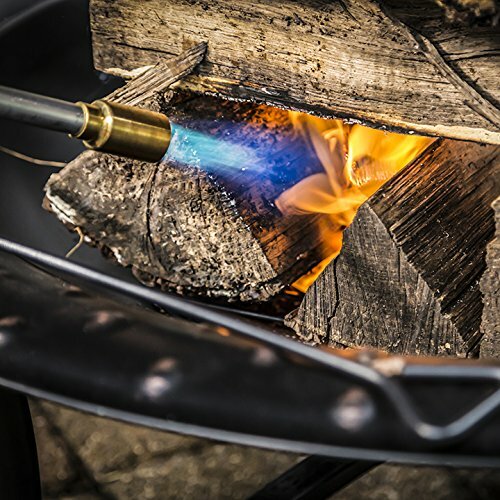 Whether it’s at home in the garden or for use on the job site, the great thing about propane torches is that they’re extremely user-friendly. Walk very slowly carrying your lit torch with care. The soundest principle is to attack weeds when they are young rather than allowing them to run rampant and become fully entrenched. Spring and summer are the optimum seasons for breaking out the propane torch. You might need to revisit particularly weed-infested areas several times over the course of a fortnight. You don’t need to reduce weeds to a pile of ash. If their appearance turns from rather shiny to a dull matte, you’ve done all that’s required. They will gradually wilt and die giving you some valuable compost in place of an unsightly sprouting spoiling your flowerbed or lawn. Avoid burning browned or dead plants and don’t start the torch on a hot, dry day. Pay close attention to our safety tips below and using a weed killer torch can be fun and rewarding as well as being perhaps the most efficient way to kill off weeds and restore your garden to its former glory. As well as having an assortment of other projects you can turn your hand to, using a propane torch to dispatch weeds in the garden is a highly efficient approach to what can be a tiring and tiresome affair. As you’ll know only too well if you’ve tried manually weeding, it takes time. Lots of it. Weed killer torches have flames that can hit 2000 degrees Fahrenheit so you can almost instantaneously nuke your weeds without needing to rely on potentially harmful herbicides and elbow grease. Alongside weeds, you’ll commonly find twigs and larger garden debris that you’d also need to pick up by hand and dispose of. If you have a bigger yard, this waste can easily build up to the point where it’s a nuisance to dispose of. Shoot for a propane torch and all you’ll have left is the satisfaction of looking over a pristine garden stripped of all unwanted foliage. Adhere to a few basic safety guidelines and using a weed killer torch need not be a dangerous undertaking. Use a light touch. There’s no need to nuke the weeds into ash! The width of the tip will affect the flame size. If you have isolated pockets of weeds in awkward spots, it makes sense to choose a torch with a fine tip and correspondingly delicate flame. Look for a tip measuring anywhere from ¾ inch up to 1 ½ inches and you’ll avoid scorching plants while you blaze away the weeds. All the torches we review are rated for heat in BTU (British Thermal Units). This measurement relates to the energy output of the weed torch, to its intensity. While this BTU rating is important, the size of the torch’s tip matters more so don’t get hung up on those BTUs at the expense of an appropriate flame size. A regulation valve allowing you to dial back how much flame is kicked out is a boon for boosting efficiency. Some weeding jobs simply don’t call for full throttle usage and you’ll save a great deal of money over time with judicious flame handling. As with all aspects of buying a weed torch, angle for a tank in line with your needs rather than expecting a one-size-fits-all solution. Smaller tanks of 12 to 14 ounces are easy to carry around but you’ll run out of gas quick smart. Larger tanks will give you more run time but they’re a bind to carry and you’ll often need an extension hose. Check out a variety of propane tanks to get a feel for what capacity would work best for you. It’s no use getting a great weed torch if it’s so complicated to use it ends up remaining in the tool shed. Look for an ergonomic ignition switch that allows you complete control. Think, too, about how easy the torch is to fire up and whether or not you’ll need to use a naked flame to kickstart proceedings. This is obviously not the best option as your hand will be much too close to where the flame starts. Weed torches are sold without propane tanks so you’ll need to invest in one of these as an essential extra. Red Dragon offer a superb squeeze valve that gives you more control, allows to indulge in a spot of welding and will save you money over time if your torch doesn’t come with an integrated squeeze valve. Price should be a factor in any buying decision but should never be the determining factor. More important is not to be lulled into a false sense of security by what seems like a low initial price tag. A propane tank is mandatory so budget for this with your initial purchase. Beyond buying, think about the ongoing cost of propane tanks. We very much hope you’ve enjoyed genning up on the best weed killer torches and you can see just how versatile these propane burners can be. Get in touch any time if you have any feedback at all. We are building this site out to cover just about every aspect of the home and garden so if there’s anything you’d like us to look into, don’t be shy and drop us a line. Now fire up that propane torch and blitz those weeds for good!